The first Royal Navy pattern sword was created in 1805, its elegant but impractical design being superseded by a solid-hilt design developed in 1827. 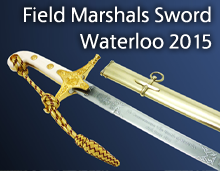 In 1846, a blade was standardised for all Royal Navy Officers. 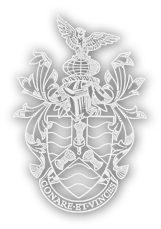 The current light, single-edged straight blade was adopted in 1929. 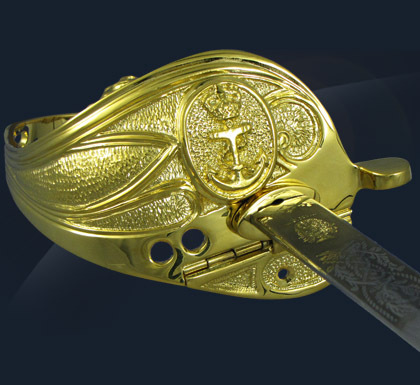 Carried by RN Commissioned Officers, today’s regulation Navy Sword features a gold-plated brass hilt, white fish-skin grip and a brass pommel in the form of a lion. The Royal Navy sword incorporates a unique mechanism that often proved a life-saver. The inner side of the guard is hinged so that it can be folded down to engage with a pin on the scabbard top mount. The scabbard is made of rawhide with gold-plated brass mounts, while officers of Flag Rank and above carry a version with more ornate, engraved mounts.